Dunston Silver Band, which is supported by Bristol Street Motors, has won a place to represent the region in the Third Section National Finals of the Brass Band Championships. 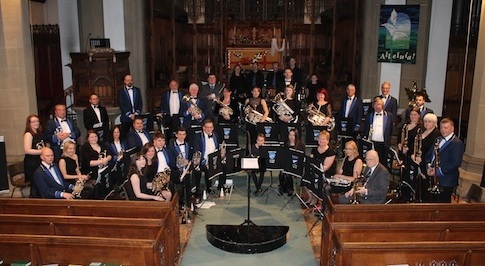 The Band achieved second place in the 2015 North of England Brass Band Championships, held at the Gala Theatre, Durham to qualify for the national competition. 'Evolution' by Philip Sparke was the chosen piece of music. In addition to the fantastic second place, the best percussion section award went to the Dunston Silver Band's section; Karen Snaith, Chris Bolt, Paul Jamieson, 12 year old Sophie Stephenson and 10 year old Charlotte Stephenson. Bristol Street Motors Peterlee Hyundai has been supporting the band since 2009, helping to fund running costs including rent and conductor's fees. The support also allows the band to develop beginner and intermediate players of all ages through individual tuition and to upgrade the music library and instruments. With history dating back to 1908 the Dunston Silver Band, originally known as Dunston Temperance Band, is a non-profit charitable organisation looking to provide music for the local community. With more than 40 members, the band has a varied programme, ranging from traditional brass band arrangements to more modern pop and film tunes. Billy Taylor, General Manager of Bristol Street Motors Peterlee Hyundai, said: "Supporting the local community is very important and brass bands are not only part of the cultural heritage of the North East, they also feature people of different generations which allows more young people to learn about music and play a musical instrument. "The success of the Dunston Silver Band is fantastic and I am delighted that Bristol Street Motors Peterlee Hyundai is able to support it." Keith Lee, Dunston Silver Band Committee Member and Trustee said: "Everyone in the band is still celebrating this wonderful achievement. We are all very proud to be representing the North East in the National Championships and will be doing our very best to make the region proud."